This pattern was inspired partly by an online knit blogger's Thrum Mitts knitalong, and partly by a friend who's moving from Memphis to Utah and is horrified by cold weather. We came up with this idea on a road trip, except that she was sure it would be the ugliest knit thing ever, and I thought it wouldn't be so bad. She's been converted, and I was pleasantly surprised. This pattern really only takes about 50 yards of yarn (the rough calculation) and so it can be made with any scraps of worsted weight yarn left lying around. For the fleece, I used one bat from a needle felting set. 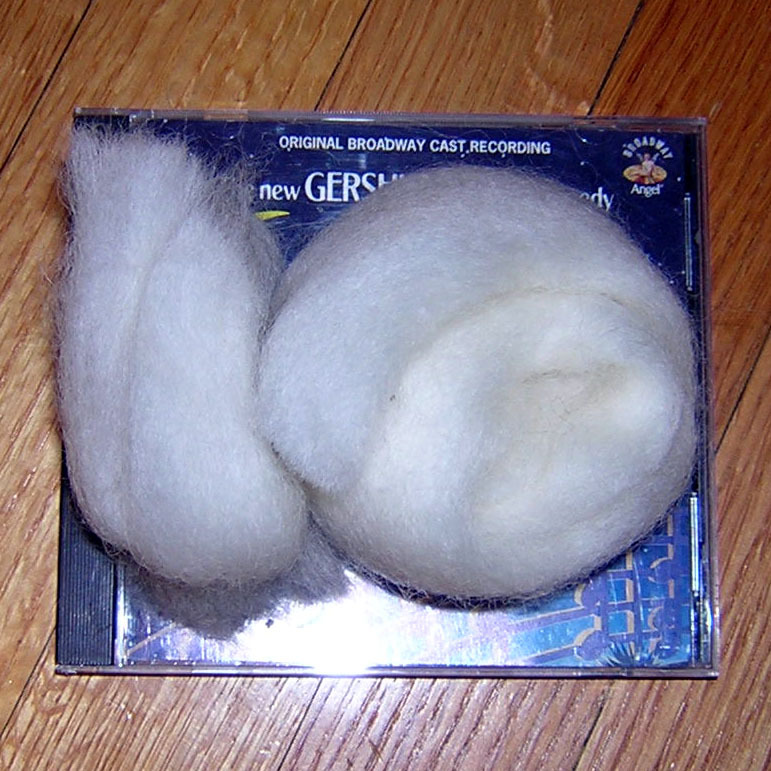 When I tried to weigh it, it didn't even register on the kitchen scale, so I've included a photo of the fleece on top of a CD case for reference. Separate bits of wool that are about 3 inches long and one half in. wide (estimating is fine). 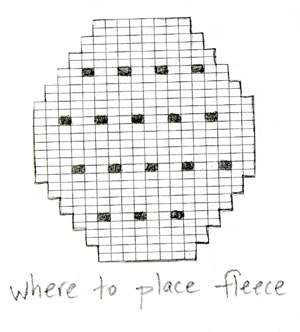 Insert right needle into stitch as if to knit, and then place the bit of fleece on the needle as if it were the yarn. 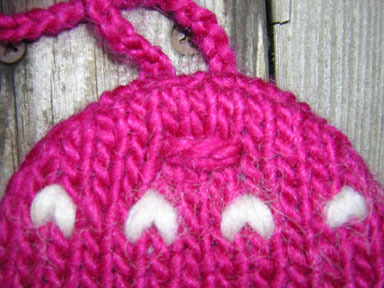 Then, wrap the yarn over it and pull both the yarn and the fleece through the stitch as if to knit. When finishing, make sure each Outside Ear piece has approximately the same amount of fleece. Adjust any differences by trimming the wool ends. Row 1 [WS]: P all sts. Row 2 [RS]: K1, m1, k to last st, m1, k1. Work these 2 rows 4 times more. 18 sts. Cont in stockinette st for 9 rows. Next Row [RS]: K1, ssk, k to last 3 sts, k2tog, k1. Work these 2 rows 4 times more. 8 sts rem. Work as for Earmuff Lining, adding pieces of fleece as indicated in chart. Work three chains, each approx. 16 inches long. Sew each Earmuff together with one Earmuff Lining, using mattress stitch for the sides of each piece and grafting for the tops and bottoms of each piece. Be sure the loose, fluffy ends of all pieces of raw fleece are contained inside the resulting small pillows. 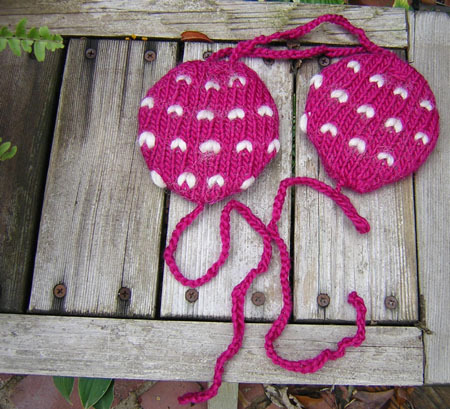 Attach one crochet chain to bottom of each Earmuff, using the yarn tail at the ends of the chains to sew securely. Weave in rem tails. 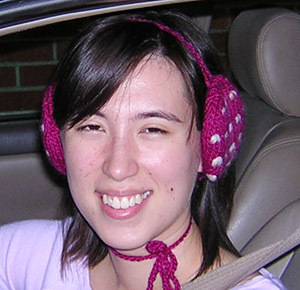 Using rem crochet chain and tapestry needle, thread entire crochet chain through top of each Earmuff, making a loop (see photos for reference). On the back of one Ear piece, tie yarn tails together securely and weave in ends. This chain can be adjusted in length to accommodate larger or smaller heads. Susan is an expat living in China who loves knitting and traveling, especially in China, except for when she gets fed up with it and wishes for clean air, quiet living, and a total lack of phlegm on the streets. Visit her blog for knitting and traveling adventures.